About a week ago, speculation began when the active.com registration link went up and showed the Wine & Dine Half Marathon weekend starting a day early. Most people guessed the addition of a 10k, but what actually happened was a bit shocking (at least to me!). If you hadn't already heard, starting this year, Wine & Dine is a totally new race. Gone is the nighttime half, a 10k was added, and, of course, runDisney added in a challenge. The half now starts at 5:30 a.m., just like all the other events. Since the Tower of Terror 10-miler is gone (or at least on hold) and the Everest challenge is too, there are now a whopping ZERO night races on the runDisney calendar. They are still planning on the after party, but it's the night of the race, 10-12 hours after running the half. What do I think? 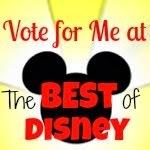 You all know I'm a runDisney cheerleader! I pretty much love or forgive everything they do. But this? THIS is where I have to draw the line. This is a big mistake. Huge. I would like to know how this even came up as an option! Was the conversation a little like, "What can we do to really piss off everyone who calls Wine & Dine their favorite weekend?" To me, it just doesn't make sense. I can guess that the major renovations at Hollywood studios might have had something to do with it, but still--no excuses! I've run the race twice: 2013 & 2014. 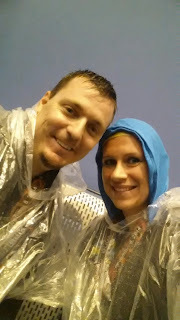 Yes, 2014 was kind of a mess with the rain, but this weekend was still my fave at WDW. 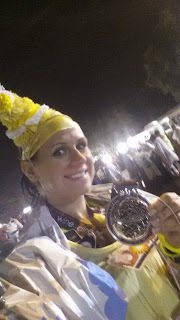 If you want to know about those races, check out my 2013 & 2014 race reports. By making the race in the morning, you lose the uniqueness of running with the lights, the glow, and the different views. You lose the buzz before the race start, which was so much fun because, unlike at 4 in the morning, everyone is awake. You lose the opportunity to enjoy the parks at night the nights before the race (because if I'm waking up at 3, I need to be in bed before fireworks). Most unfortunately, you lose the after party right after the race. Yes, it smells. Yes, you're sweaty and uncomfortable. BUT there is nothing like partying with your racing friends! I have to assume that the after party will lose it's luster. Runners will have been up early, ran, then what? Go nap? Then are they really going to stay up until 4 a.m. at a party 24 hours after they started the Wine & Dine journey?